Contemporary, modern, rustic slab executive custom desks. This custom desk was made to order using walnut. We also cherry and maple and other exceptional woods!!! 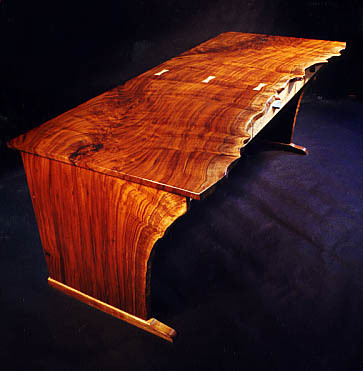 Call today for a quote on a custom desk made especially for you or choose a custom desk from our gallery. The drawer fronts are birdseye maple with ebony pulls. Slab claro Walnut executive custom desk with panels that are spalted curly maple and a birdseye maple center panel.